Our spine is a wondrous part of the body. Not only does it, through its use of 33 flexible vertebrae allow us the freedom of movement in our upper torso to move left and right and twist side to side, it also houses the spinal cord which runs through holes in each of the vertebrae and holds the critical job of carrying messages to and from our brain sent to the nervous system that controls the use of our muscles as well as the sensation of touch and the ability to feel pain, a warning system that something is wrong. But, because of all the movement experienced by the vertebrae in the spinal column, it is not uncommon as we get older or through disease, bad posture or injuries for our spine to suffer degradation or wear which is often painful. Sometimes surgery is needed to correct this, and one such surgery is thoracic disc herniation surgery. What is Thoracic Disc Herniation Surgery? Before thoracic disc herniation surgery is considered, patients will often be advised to try the several non-surgical alternatives for pain relief as most thoracic herniated disc symptoms can be treated without surgery. If surgery is needed this is almost always in the case of myelopathy, a spinal cord dysfunction. The thoracic disc herniation surgery is a procedure called decompression and is designed to take pressure off the pinched spinal cord or nerve root. It has an almost 80% success rate in relieving pain and pressure from the spinal column and is a widely performed procedure once all the non-surgical attempts at relief have failed. There are several different ways to perform the thoracic disc herniation surgery procedure, but most often the endoscopic method will be used. This surgery is called the video assisted thoracoscopy surgery or VATS for short. A thorascope, which is a small TV camera is passed through the chest cavity and the surgeon watches on a TV screen where he will treat the herniated disc by removing a small part of the patient’s vertebral body and problem disc. In rare cases, spinal fusion surgery is sometimes needed right afterward if a larger section of the vertebra has to be taken out. Thoracic disc herniation surgery is a procedure that is fully covered by the National Health Service, but is often the absolute last resort – the NHS state that only 1 in 10 disc herniation problems actually require surgery and patients should look towards non-surgical alternatives first. If you do need to pay for the surgery for whatever reason, book a consultation with your surgeon who, once he has thoroughly assessed your specific circumstances will make a good recommendation on how you should proceed as well as the costs involved. 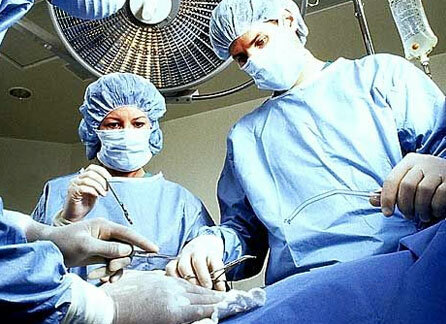 As with almost all surgical procedures thoracic disc herniation surgery may have complications. Because surgery is taking place around the spinal cord, it is extremely delicate and potentially dangerous. Make sure you are comfortable with both the risks and the benefits before opting for the thoracic disc herniation surgery.